Squadron Leader Mohinder Kumar Jain was born on 27 December 1937 in Jalandhar district of Punjab. Son of Shri Kapur Chand Jain, Sqn Ldr Jain was commissioned into the Indian Air Force on 23rd March 1957. Sqn Ldr Jain after his initial training was posted to various Air Force bases and gained experience in flying different types of aircraft. By 1971, Sqn Ldr Jain had already completed 14 years of service in the Air Force and evolved into a competent and ace pilot having expertise in various types of air operations. During 1971, he was serving with 27 Sqn operating fighter bomber Hunter aircraft. When the war with Pakistan broke out on 03 Dec 1971, IAF launched numerous strikes against enemy targets commencing 04 Dec 1971. Sqn Ldr Jain of 27 Squadron was tasked with a mission on 04 Dec to strike an enemy airfield at Mianwali in Pakistan. Sqn Ldr Jain carried out two strikes on the airfield and attacked enemy aircraft parked on the ground. As he turned homeward after the attack, he was attacked by enemy Air Force Sabre and Mirage aircraft. However, Sqn Ldr Jain successfully tackled the enemy attack and disengaged himself to bring his aircraft safely back to base. On the 5th, 7th and 9th December, 1971, Sqn Ldr Jain carried out further successful missions to Poonch, Sambha and Dinanagar Sectors in support of our ground forces. On the 10th December 1971 Sqn Ldr Jain was detailed as leader of a two aircraft strike mission, to the Chhamb Sector. It was an interdiction mission in support of our advancing ground forces with Sqn Ldr Jain flying Hunter (A-938). The enemy assets were well guarded with ground based weapon systems and the mission entailed considerable risk. Despite heavy and concentrated ground fire Sqn Ldr Jain made accurate bomb and cannon attacks on the enemy positions. However, during this action his aircraft was hit by enemy anti aircraft guns and crashed in the enemy territory. Sqn Ldr Jain was martyred but throughout these operations, he displayed gallantry, professional skill and devotion to duty of a very high order. Sqn Ldr M K Jain was awarded “Vir Chakra”, for his exceptional courage, indomitable spirit and supreme sacrifice during the air operations of the war. Squadron Leader Mohinder Kumar Jain is survived by his wife Kamlesh Jain and a daughter. 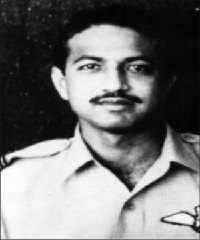 During the operations against Pakistan in December, 1971, Squadron Leader Mohinder Kumar Jain was serving with a Fighter Bomber Squadron in the Western Sector. on the 4th December, 1971, he carried out two strike missions over Mianwali airfield and attacked enemy aircraft parked on the ground. As he turned homeward after the attack, he was attacked by enemy Sabre and Mirage aircraft. He successfully disengaged himself from the enemy attack and brought his aircraft safely back to base. On the 5th, 7th and 9th December, 1971, he carried out further successful missions to Poonch, Sambha and Dinanagar Sectors in support of our ground forces. 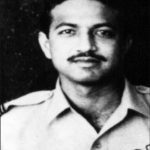 On the 10th December 1971 he was detailed as leader of a two aircraft strike mission, to the Chhamb Sector. Despite heavy and concentrated ground fire he made accurate bomb and cannon attacks on the enemy positions. During this action his aircraft was hit and crashed in enemy territory. Throughout these operations, Squadron Leader Mohinder Kumar Jain displayed gallantry, professional skill and devotion to duty of a high order.